Most employers often complain that the cost of tower fall prevention training and equipment is on the high side. These trainings are however important to prevent tower falls which are mostly very fatal. There have been cases of tower climbers falling to their death during tower installations, which makes adequate training and tower climber safety tips very important to prevent such deadly falls. Employers know the high expenses that accompany such falls as they will be fined heavily for safety lapses by concerned agencies with their job sites closed for several months while the investigation into the falls last. Most times when such sites are reopened, the enthusiasms among the workforce reduce drastically as a result of psychological distress and rustiness. This has further enhanced the need for adequate training for tower climbers to make sure they observe all necessary safety precautions while climbing to save themselves from such falls and save their employers the losses recorded when such falls take place on their sites. Employers have been advised to provide proper safety training, site and equipment maintenance to prevent the emotional and financial shakeups that affect all parties involved when a tower climber falls during tower installation projects. Several factors have been identified as possible causes of fatal falls for tower climbers. Such factors include weather conditions as at the time of undertaking the tower installation project, high electricity voltage, falling objects, and several other hazards that are capable of tipping the balance of a tower climber. The need for the right safety tips and gear for climbers safety was became more evident after two young amateur climbers had fatal falls in 2011. New tower climbers are more prone to fatalities than the experienced ones. The fact that no other industry has experienced the rate of fatal falls the tower climbing industry has recorded prompted in-depth research into the major causes of these falls. These researches showed that most of the falls experienced by tower climbers occur due to wrong use of tower gear and inadequate adherence to safety rules and procedures. Only a few of these falls occur due to gear failures. There are certain major safety procedures you must always observe before undergoing any tower climbing project. Below are some of the tips that can help keep you safe while working at height. It is wrong to start your way up the ladder without making all necessary adjustments to all your tools and equipment. Never be in a haste to get up the ladder without checking the gear and all other tools to make sure they are in good shape. Being fully prepared involves taking all necessary security measures like monitoring the weather daily to make sure you are climbing when the weather condition is more favorable. It is a known fact that when accidents occur at high heights, the weather condition can go a long way to determine the safety of the climber before help comes to him. Most times, tower climbers are exposed to intense heat while working up there. 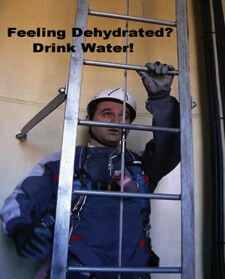 It is advised that you stay as hydrated as possible while working at ground level, which makes adequate hydration a must for you as a climber working at great heights. Inadequate hydration can lead to a number of problems that may result in fatality cases. Some of the problems that can arise from inadequate hydration for a tower climber are; heat stroke, weakness, confusion, dizziness, nausea, fainting, and exhaustion. It is always important that you give yourself proper physical and fitness check before you embark on any tower climbing project. Make sure you feel energetic and strong enough to embark on the climbing project before you commence. Make sure you are not under any heat-related illness before you start climbing. Check for heat cramps in the muscles of your hands to forestall being unable to properly attach the snap hook of your safety positioning lanyard to an anchor point to enable you stop and rest safely at intervals while on the job. Knowing the symptoms of all heat illnesses and monitoring yourself and other members of your tower climbing team is of utmost importance. The truth remains that a fall may still happen at any time despite all the safety measures taken. This makes the enforcement of efficient work site prevention and emergency rescue plan to rise to the occasion in case of any falls very important. These precautions have helped handle life-threatening situations very adequately on several occasions. Tower climbing equipment manufacturers continue to make the job of tower climbers easier and safer. The full body sling helps redistribute the pressure from your body weight away from the leg straps of your harness. This will not only increase your comfort, but goes a long way to keep you in a work position for longer periods. With the full body seat sling, you can afford to stretch out your leg in front of you, taking attention away from the pain in your legs and focusing on the job at hand. If you have a team of your climbers working with you, chances are that most of them do not have the necessary trainings and experience to prevent fatal falls while climbing. 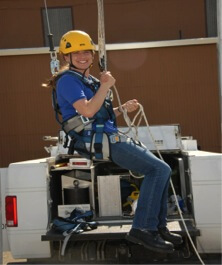 It is your job as the crew leader to hire any of the companies reputed for the quality of safety training offered to tower climbers to come to site and train your crew members. These companies offer climbing safety, climbing skills, and rescue tips. Some major climbing equipment manufacturers are also known to offer training and consulting services for tower climbers’ safety. Following these climbing tips, techniques and using the right safety equipment the right way will help you enjoy a safe and long tower climbing career. Using the right gear for your tower climbing projects and having the required level of professional training and knowledge will keep you safe, and still go a long way to reduce your job stress.